“It’s no longer enough to sell the sizzle. Customers today want to know what’s behind it — what the brand stands for.” While many (mis)categorize branding as simply a logo or a department or responsibility within the marketing department, strategist and author Mona Amodeo sees branding as a way of managing an organization. We discussed all of this and more on this week’s episode of the On Brand podcast. Mona Amodeo, Ph.D. is an innovator and catalyst for transforming organizations into brands that matter. She is an award-winning management strategist and recognized expert in organization development and change on a mission to move business-as-is to business-as-it-can be. Her work spans the boundaries of scholarship and practice in the disciplines of branding, communications, and organization culture. In her book, Beyond Sizzle: The Next Evolution of Branding, Mona shares the secrets to igniting transformation by leveraging organization development principles and change management approaches as a new framework for business leaders to manage their brands. 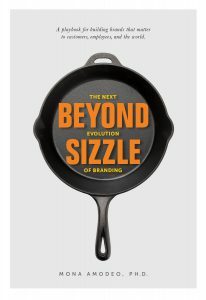 To learn more, go to idgroupbranding.com or check out Mona’s new book, Beyond Sizzle, on Amazon.